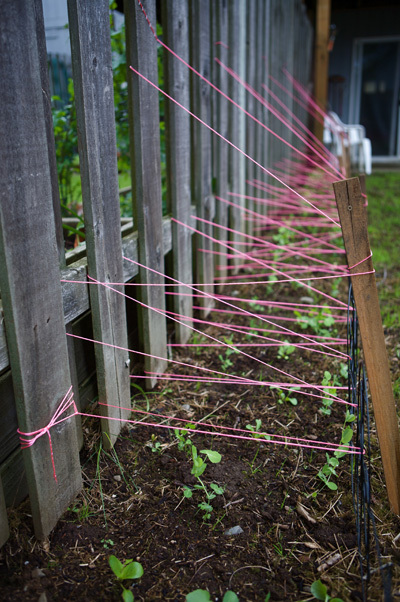 Spring is in full swing here in Portland, and I am ever the impatient gardener. Sometimes it seems like it’s taking forever to get things going, like nothing I’ve planted is growing. I have to remind myself that it’s only just mid-May. Some US regions are still awaiting the last frost, and some people just starting planting! A wonderful way to regain a little perspective (and renew my enthusiasm!) (as if that needed renewal! ), is to take a look back to remind myself how much has already happened. My little plants have come a long way, and it really hasn’t been so long . 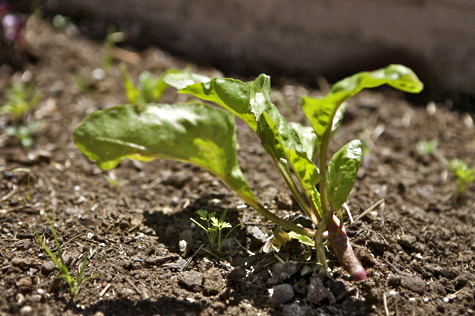 . .
^^^ Remember these beautiful little heirloom beets that I started from seed back in the middle of February? Now they take up residence in one of my red raised beds, growing strong and flanked on either side by nantes (carrots) and walla wallas (sweet onions) planted from seed. They’ve had a bit of a tough time getting started, but I think they’ve stabilized now. Root veggies get along great, and do especially well in a raised bed. 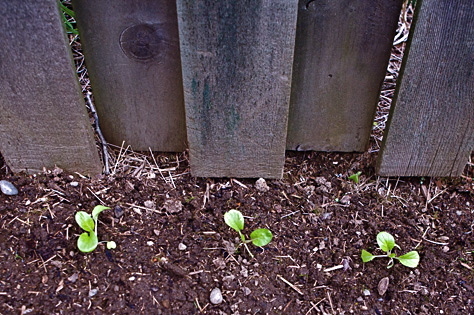 ^^^ And remember these, my petite pak choi’s? 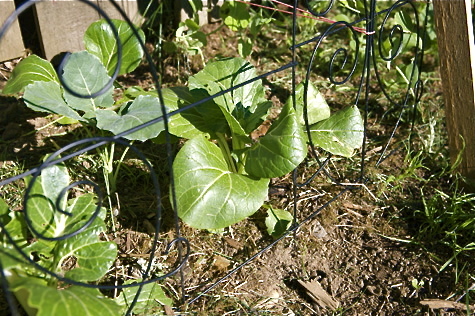 I put these into the ground almost exactly a month ago, when they were mere seedlings, with only a few true leaves. Look at them now! Full fledged chinese cabbages! Well maybe not quite yet, but they’re getting there, and I’m very proud of them. I even used some of the outer leaves in a salad this weekend. The first harvest! 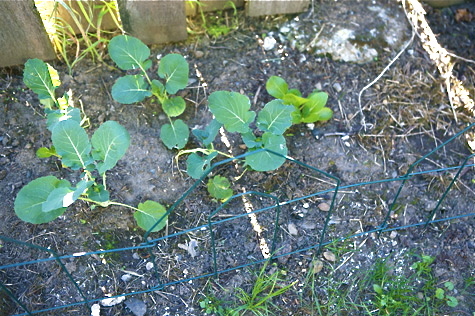 ^^^ I transplanted these baby broccolis that same weekend as the pak chois. They were so wee back then, but look how they’ve taken off! They’re almost a foot tall a lovely dark green hue. Although I’ve got them in a nice shady spot at the northwest corner of the garden, I’m a little worried for them in the impending summer heat. I’m thinking of trying to build a cucumber canopy over them for additional shelter. In the meantime, please cross your fingers for them! They’re already reaching for the top string! Woo-hoo! Go little sugar peas go! 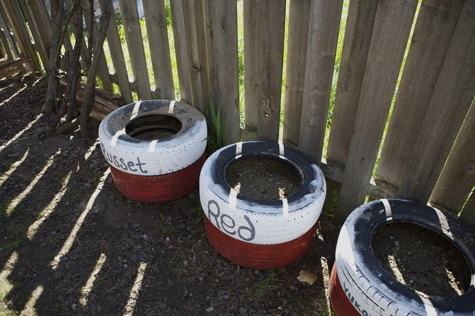 ^^^ And of course, the potato tire project. I set this up a little over 3 weeks ago, and it took a bit of time before the potatoes sprouted. Honestly, I thought it wasn’t going to work! 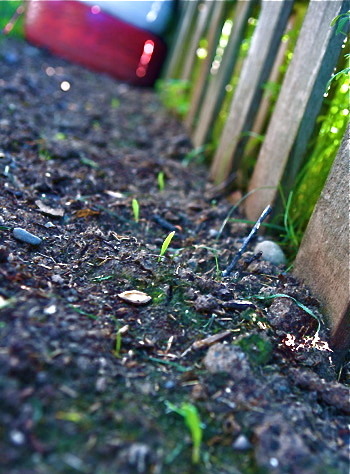 But then the reds poked their little buds out of the soil, and I breathed a sigh of relief. A week later, the russets and the yukons followed. Check ‘em out! Now the reds are flourishing and it’s almost time to put another tire on. And the russets and yukon golds can’t be far behind. I’ve also got a bit of brand new growth to share. Some species just don’t transplant well, and must be sown directly into the earth. 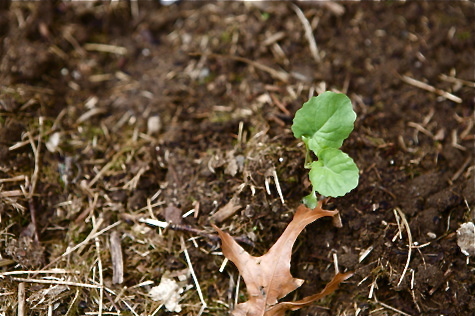 3 weeks ago I buried some corn kernels along with a prayer (between the squirrels and the birds, I fear for any loose seeds in this soil). I had all but given up hope on them, because 2 1/2 weeks later, there was nothing but new weeds to pluck. But then! Just a few days ago, I noticed some straight little shoots as I was weeding. Some straight little shoots, all in a perfect row. My corns! Welcome to the world, little ones! Right now I’ve also got a wide variety of tomatoes comfortably adjusted to the other raised bed. 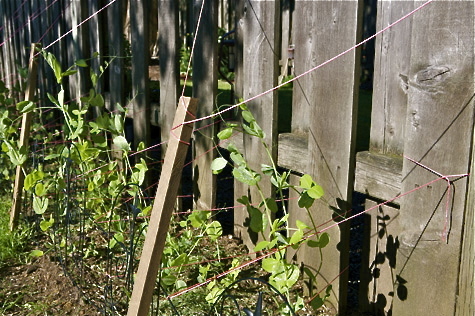 I’m working on a sunflower line along the back fence and a strawberry patch behind the raised beds. Around the side of the house I’ve got a raspberry stalk left over from last year (I thought they all had perished, so I was very excited to see new growth on one of them! ), and I’m thinking of putting a pumpkin patch under the front stairs. Those zinnias I started from seed are all potted up and loving life on the front stoop. I’ll post pictures when they bloom. Indoors I’ve got some exotic cucumbers already sprouted, along with some jalepeños, some yellow bell peppers, and some very slow-growing basil buds. Soon I’ll be starting my pickling cucumbers, and of course I’ve got to get moving on the patio potted herb garden! Later in the season I’ll start my winter squashes – this year I’m doing acorns, butternuts, and pumpkins of course. Ah, so much gardening, so little time! But oh, how I LOVE it! What about you, my dears? What are you growing and how is going so far? 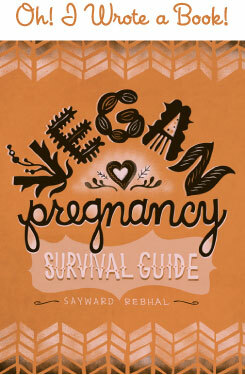 Sayward, very cool. Ambyr and I (Jacob) are checking out your garden. 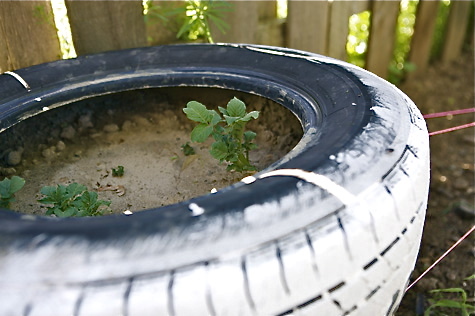 We really like your use of tires. Can you answer something? When you add your 3rd tire, what do you put in it to “fill it in”? Do you put straw? Do you know if it is too late to plant potatoes? We are well in to the heat now in Sacramento. @ Valerie – Thanks! It’s funny, I was thinking how I just wasn’t growing as much as I intended to this year . . . until I took inventory! i AM growing a bunch, haha! Could you maybe do a windowsill garden? You can get some good herbs going on a sunny sill. Or at least some cacti! =) It’s good to have flora around. I think it’s nurturing for the psyche. i like more pictures from plant level or other angles than down. Nice! The tire plants look awesome. 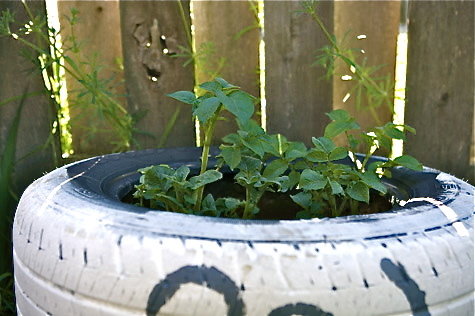 If I started a tire project now (I have some lying around the shed), what would be ok to grow this late? Anything? Most everything in my garden is perennial and not so edible, but a few of the vegetables my roommate planted are starting to emerge. Then there is a ton of huge rhubarb, which I belatedly realized is kinda poisonous raw after eating some (tasty oxalates). @ Alex – I don’t think it’s too late to start potatoes from seed. Carrots can still go from seed outdoors as well. 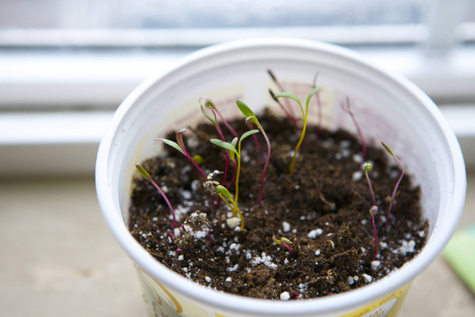 Other than that, I’d start seeds indoors to transplant (but start soon, because you’re running low on time!) or just buy some starts. People’s Co-op has tons, all organic, for super cheap. You could do all sorts of stuff in tires! Tomatoes would work great, or they’d make great mini raised beds for root veggies like carrots, onions, beets, or radishes. It’s not to late to plant your fall gourds from seed, so you could do acorn or butternut squash or pumpkins.